Some locations are hard to beat, and Chalet Hotel des Deux Domaines has secured one of them, right in the heart of the wonderful Paradiski area. The hotel is both very close to the slopes and yet conveniently just 350m from the village centre, enabling easy access both to the slopes and to the resort’s various other amenities. From the ski-room level, doors open on one side to the ski-track connecting through the trees onto the piste, and on the other to the pathway leading up to the attractive resort centre. From the ski-room door, a flattish track through the trees leads with a short ‘skate’ straight onto the Arpette blue run down to Plagne Bellecôte centre, from where a choice of five different lifts fans out in all directions. At the end of the day, make the same piste your last run, and the same track leads you home to your own ski-room door. The children’s ski garden is also within easy reach, only approx. 150m from the upper exit of the Chalet Hotel. Chalet Hotel des Deux Domaines offers the ideal family ski holiday, with well appointed and spacious family rooms and suites. The dedicated children’s Nursery and Snow Club Rooms are furnished and equipped for children’s play and there are childcare options for infants and children up to 12 years old. there is a stylish foyer lounge-bar area, the dining-room offers spectacular views across the valley and there is extra space available for breakfast in the pool-side ‘Bellecôte’ Room. The indoor swimming-pool and wellness area are a popular attraction for families, and for the added enjoyment and relaxation of our adult guests, children under 13 years old are not permitted into the upper level of the wellness area. Here the sauna, steam-room, indoor spa-bath and outdoor hot-tubs will provide a tranquil haven for parents to relax and enjoy some ‘grown-up’ time away from their offspring, whilst on the lower level the pool itself is open to all the family. Holidays to this property are particularly suitable for families. 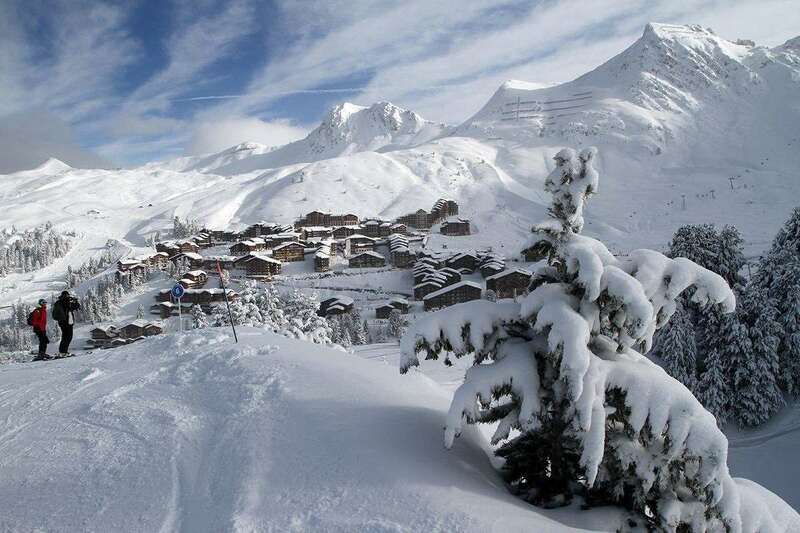 Belle Plagne Rooms – sleep 2-3 guests, with double/twin beds and a full-sized single bed/sofa, (en suite bath/wc, hairdryer, bathrobes, TV/DVD, most with balcony). Some pairs of inter-connecting rooms are available for families of 5-6. Paradiski Family Suites – sleep 5 guests, with two separate sleeping areas, one bedroom with double/twin beds and a full-sized single bed/sofa (en suite bath/wc, hairdryer, bathrobes, TV, some with balcony), inter-connecting with a living-room/second sleeping area, with one double sofa-bed (en suite shower/wc, TV/DVD, balcony). All rooms will also take a cot, and the suites will take two cots if required. Four ‘Super-Suites’ are also available for extended families or where two families are travelling together, and are at Paradiski Suite prices. Please see the accommodation summary below for details. Reception and lounge area with bar, dining-room, Bellecôte breakfast-room, Snow Club and Nursery. Leisure area with swimming-pool with shallow children’s section, relaxation room, and indoor spa-bath. First Floor Stairs up from swimming pool to adult-only wellness area, with 2 steam-rooms, sauna, 2 massage-rooms and an outdoor spa-bath. Blue = balcony £2.50 Black = balcony with valley views £3.50 Pink = other special features £4.50 (please enquire at the time of booking) *Suite 210c has shower/wc (not bath), and has its own spa-bath on the balcony. Supplement £7.50 p.p.p.n. **403 has no balcony & no room supplement. Super-Suites 2nd Floor: Rooms 210a, 210b & Suite 210c combine into one Super-Suite, sleeping 11, with 4 separate sleeping areas. (Min. 6 full paying persons before child discounts or empty bed charges). 3rd Floor: Room 311a & Suite 311b combine into one Super-Suite, sleeping 8, with 3 separate sleeping areas. (Min. 4 full paying persons before child discounts or empty bed charges). Stayed here at Christmas and loved it. Food was really good and restaurant has great views. Rooms are massive and really high quality - it&#39;s a big chalet hotel with lots of people but it&#39;s big enough to cope. It&#39;s ski in / out town in to la plagne but the kids have to walk up into town to the beginner area which is a lot for their little legs. Pool was great kids club superb. We have just returned from the Hotel. We travelled as a group of five families all with children under 10 years. The location was simply excellent with easy access to the slopes which made for stress free skiing. The children were made very welcome by the staff and thoroughly enjoyed their holiday. The food for the adults was varied, extremely good and universally enjoyed. Unfortunately the children's food was not quite as good and was not so well received. The rooms were very spacious, clean and well maintained. Highly recommended.